presto_z had the most liked content! Is this the aftemarket you refered to? http://ak-builder.com/index.php?dispatch=products.view&product_id=30209 Yes it is, I have 4 sets from when Centerfiresystems had them for 39.99 a few years back. Centerfiresysters, apexgunparts, whatacountry, and AtlanticFirearms are all good places to look. 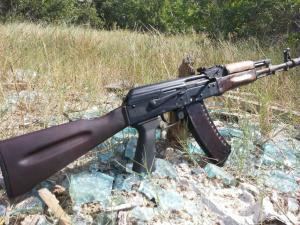 Ak-builder has some replica furniture for a decent price. That one was dimpled, some of the older ones are pinned on. I prefer when they are pinned lol. I don't know if I'm going to install this one, it was more of a test. I may make another one with non dimpled parts. I've riveted pistol grip nuts in place from milled kits in the past. Lots of oil.. An air hose is beneficial as well..
From the CSS site "We highly recommend the "Saiga 12 Barrel Nut" to allow for easy secure installation and removal of Muzzle Brakes and Flash Hiders.Barrel Nut sold separately." Thanks for the reply, that looks awesome. My brake should be in this week. No, not at all.. I have about 10 parts kits, some are in good shape, others are not.. This one is Egyptian and has some rust, but after a trip to the sand blaster and a fresh coat af molyresin it will clean right up. When this pic was taken the barrel wasn't even pressed into the front trunion..
whats the best budget optic for a 7.62x39 saiga? Vortex Strikefire with an RS Regulate side mount... Or a TWS Top Cover. I recently moved (Jan 1) and in the process misplaced some of my tooling.. More specifically my Thread Alignment tool for 14x1 LH. There is no worse feeling than knowing you have something, but having no idea where its at.. So after an hour of searching i decided Id make my own Unfortunatly i didnt take pictures along the way, but Ill try to describe in detail exactly what i did. First off here is the finished product I knew the hardest thing to make woud be the actual threads on the T.A.T. since i didnt have a lathe, or the more obvious a T.A.T In the process of searching for my tooling i ran across some old Romanian Front Sights with short sections of barrels that were threaded The next thing to do was press out the FS pins and then press it off of the demilled barrel. After that I chopped off the threaded section with a Cut Off wheel I then found an old stripped out chuck key froma drill press I no longer own. It was fairly close to the inside diameter of a 7.62, so turning it down was a pretty fast process. I ended up chucking one end of the cut off chuck key into a drill and used some Aluminum oxide sandpaper to turn it down to the desired diameter I left one end slightly larger so i could press fit it into the short section of threaded barrel. I dont have an exact measurement on that since i did it on the fly and didnt take pictures until the project was complete. I made it where the crowned side of the demilled barrel would touch the crowned side of the unthreaded barrel. All in all i spent an hour or so making this.. I recently moved (Jan 1) and in the process misplaced some of my tooling.. More specifically my Thread Alignment tool for 14x1 LH. There is no worse feeling than knowing you have something, but having no idea where its at.. So after an hour of searching i decided Id make my own Unfortunatly i didnt take pictures along the way, but Ill try to describe in detail exactly what i did. First off here is the finished product I knew the hardest thing to make woud be the actual threads on the T.A.T. since i didnt have a lathe, or the more obvious a T.A.T In the process of searching for my tooling i ran across some old Romanian Front Sights with short sections of barrels that were threaded The next thing to do was press out the FS pins and then press it off of the demilled barrel. After that I chopped off the threaded section with a Cut Off wheel I then found an old stripped out chuck key froma drill press I no longer own. http://i156.photobucket.com/albums/t4/presto_z/20130113_132908.jpg It was fairly close to the inside diameter of a 7.62, so turning it down was a pretty fast process. http://i156.photobucket.com/albums/t4/presto_z/20130113_133325.jpg I ended up chucking one end of the cut off chuck key into a drill and used some Aluminum oxide sandpaper to turn it down to the desired diameter http://i156.photobucket.com/albums/t4/presto_z/20130113_134714.jpg I left one end slightly larger so i could press fit it into the short section of threaded barrel. I dont have an exact measurement on that since i did it on the fly and didnt take pictures until the project was complete. I made it where the crowned side of the demilled barrel would touch the crowned side of the unthreaded barrel. All in all i spent an hour or so making this.. I plan on chopping my barrel down and permanently attaching a gk01 clone brake to the end to give me an 18.5 overall length.. Do you think it will function low brass without opening the gas ports?